One of the most popular crazes in decorating is using authentic retro ideas for retro décor in your home décor plan. As they say, "all things old are new again". Very true in this day and age. But, how do you go about incorporating these ideas for Retro Décor? Let's take a look at my sister's house, some products, photos and suggestions you can use to create that perfect hint of Retro Décor in your home. 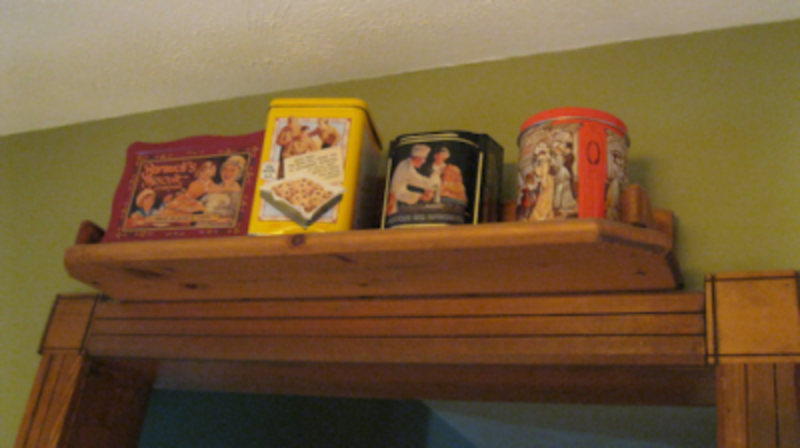 Using small or large vintage advertising items in your décor plan is simple and can really be a conversation starter. For kitchen or dining room area, use old tin cans with labels, flour sacks, spice bottles or tins, advertising glassware and the like. This picture is of a built-in bookcase in my sister's dining room. Notice the advertising items she has incorporated along with some Vaseline glass, vintage Ball jars, pitches, glassware, canisters and a collection of enamelware. 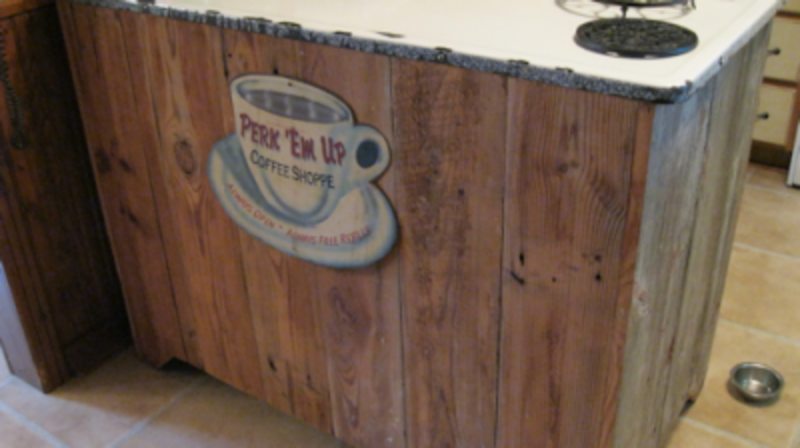 It makes a wonderful display and offsets her more modern, square, counter height, wood dining table. 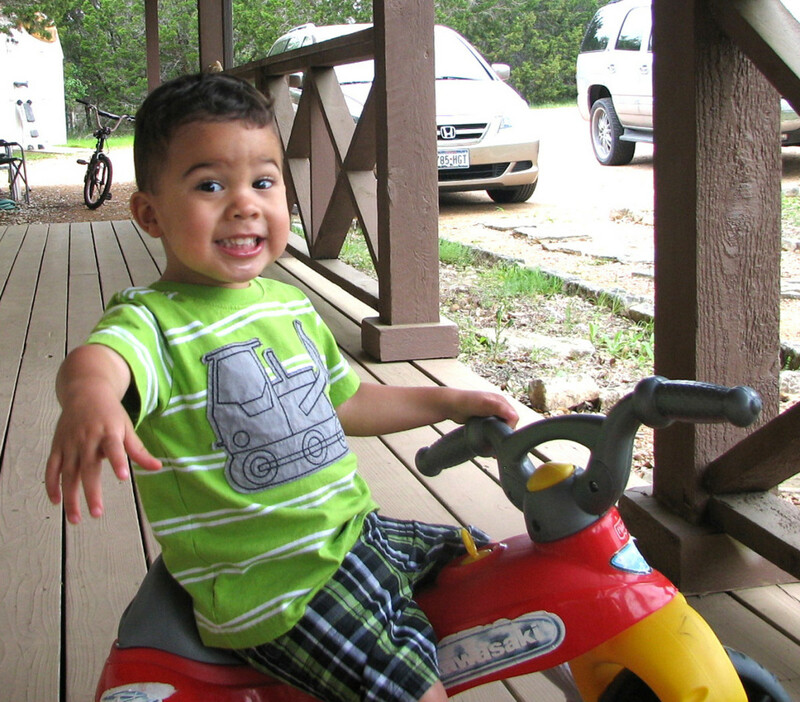 A "Vignette" is a grouping of items displayed together. It can be a furniture, wall decor, tabletop or bookcase shelf grouping. Think of it as creating a small "scene". In the litchen, consider using your homes architectural features to your advantage. In the photo above, the bulkhead is used as a display area. 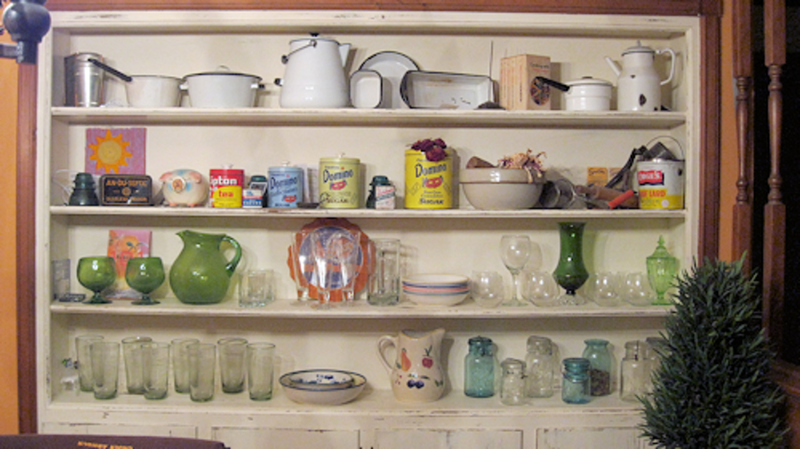 My sister hung old kitchen tools and utensils she collected in a very eye pleasing manner. Again, bringing in the vintage feel. It mixes nicely with the other décor elements in her kitchen, both old and new to create that eclectic feel. Add shelves to a wood column, above doorways, display a retro grouping on your fireplace mantel or on top of a half wall. 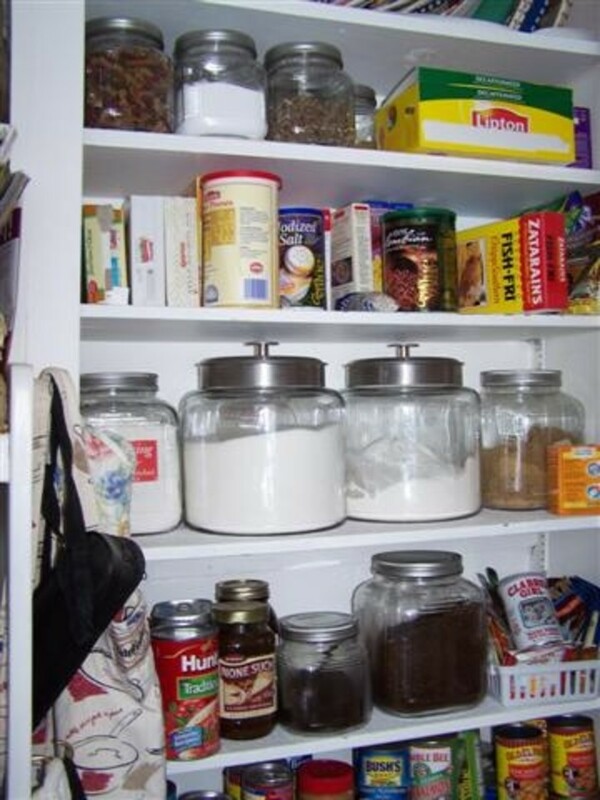 Look around your house for areas that you wouldn't normally decorate and decorate them! Mixing vintage or antique items with new, more modern decor makes for an eclectic look and feel. 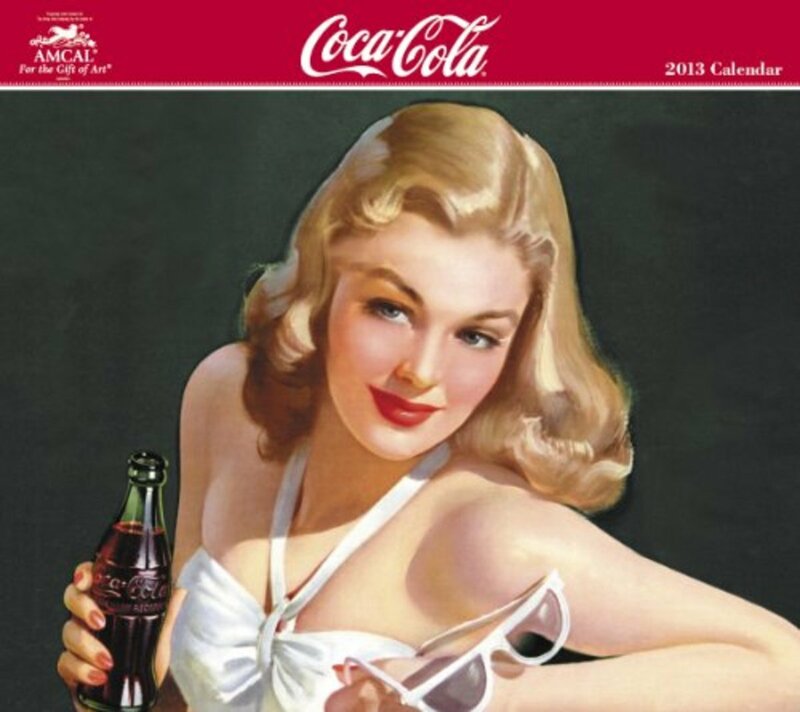 Other ways to incorporate retro advertising into your décor plan is to use metal signs reminiscent of vintage products. These can be used in any room of the house or even just a hallway or foyer. 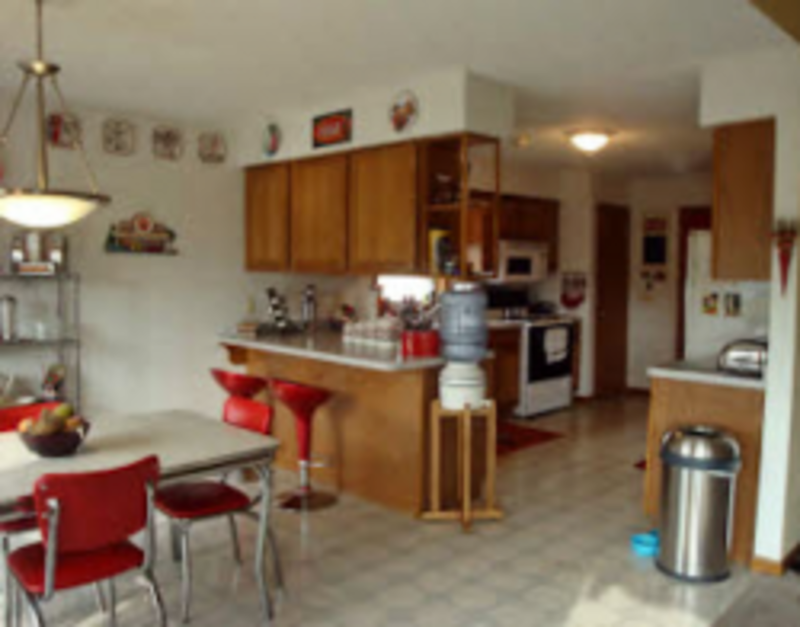 I had a retro Coca-Cola kitchen at one point. I wanted something different to add to the metal signs and plates I had for the walls. I visited my local vintage antique mall and bought a few copies of old "Life" magazines. I took some of the full page ads out and framed them and then hung them in the kitchen. They were fantastic and I got lots of compliments. 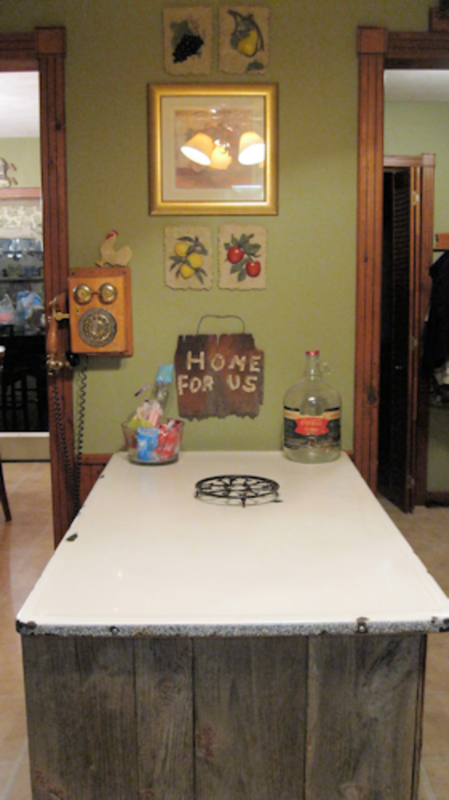 This is an original Hoosier Cabinet that sits in the hallway. Notice the new candelabra and red bottles on top. My sister stores seasonal décor in the pull out counter area. Easy to get to but not seen in the mean time. 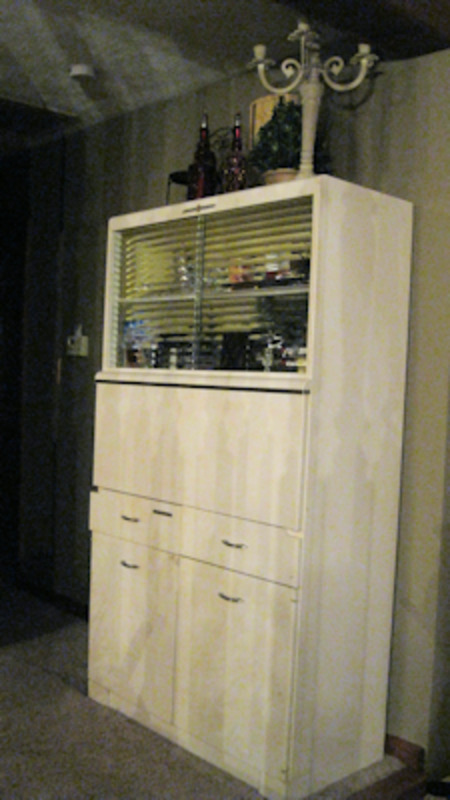 Another cabinet in the living room. It's a large pie safe. One of the doors remains open and displays family photos. Throws and afghans are stored in the bottom. 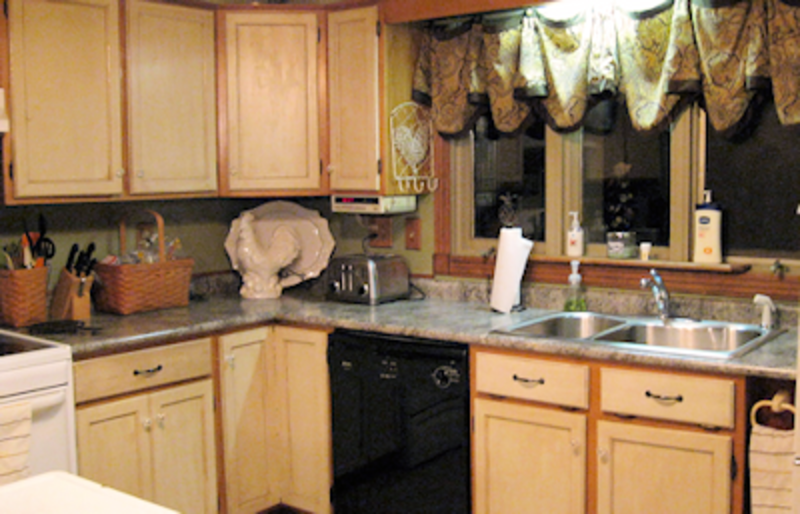 She re-did the cabinets in the kitchen with a two-tone look -- very retro -- then added granite-look formica counters. Mixing old and new again. See the large ceramic rooster sits next to some new Longaberger baskets. 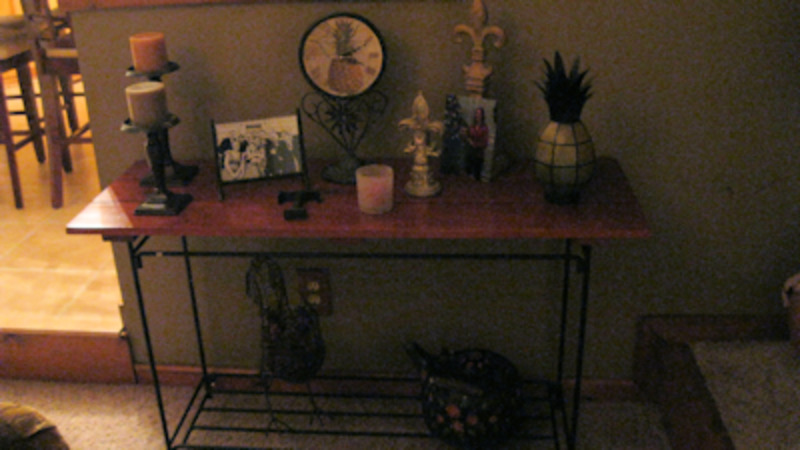 The sofa table sits on a wall in the living room and is filled with a nice mixture of old and new -- cast iron tea kettle and wire chicken on the bottom shelf with frames, candles and figurines on the top of the plank board surface. 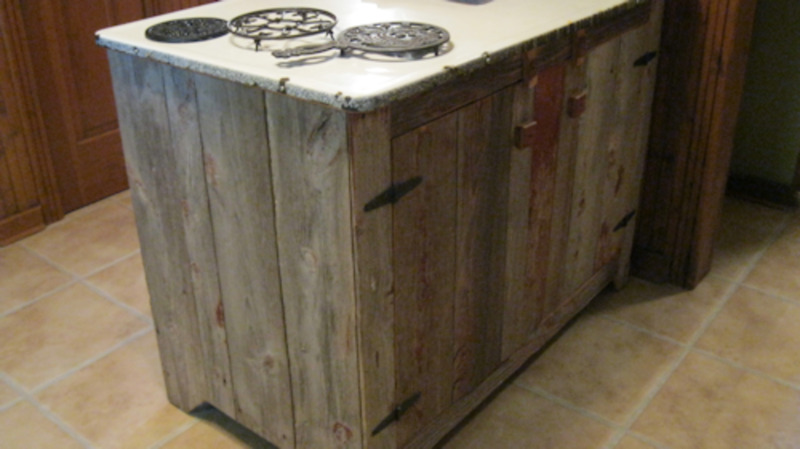 Custom built from re-claimed barnwood, this kitchen island is right at home on top of the ceramic tile floor of the kitchen. 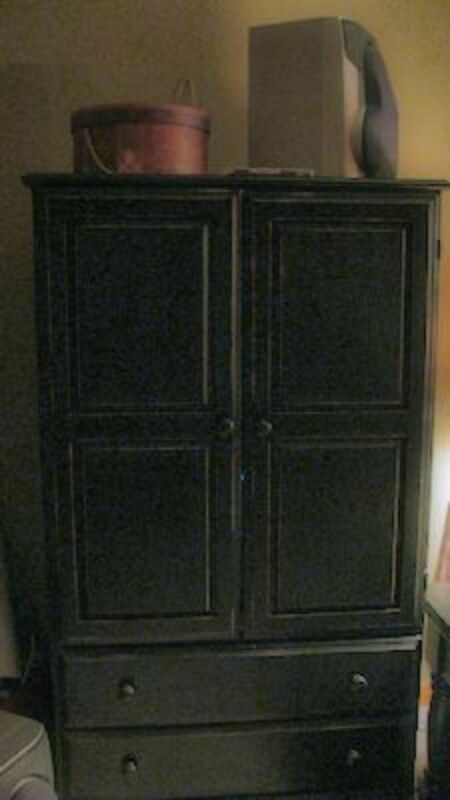 Use an old chifforobe (shiff-robe) in the livingroom to store movies, games, linens or anything else you want close at hand but not seen. 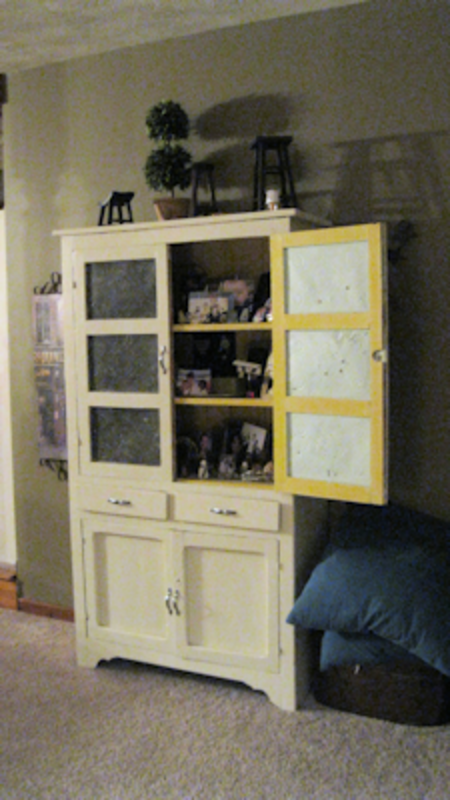 This one was painted black and then distressed. I am an eclectic style decorator. Basically, that means I mix and match different styles to create a whole new style all my own. 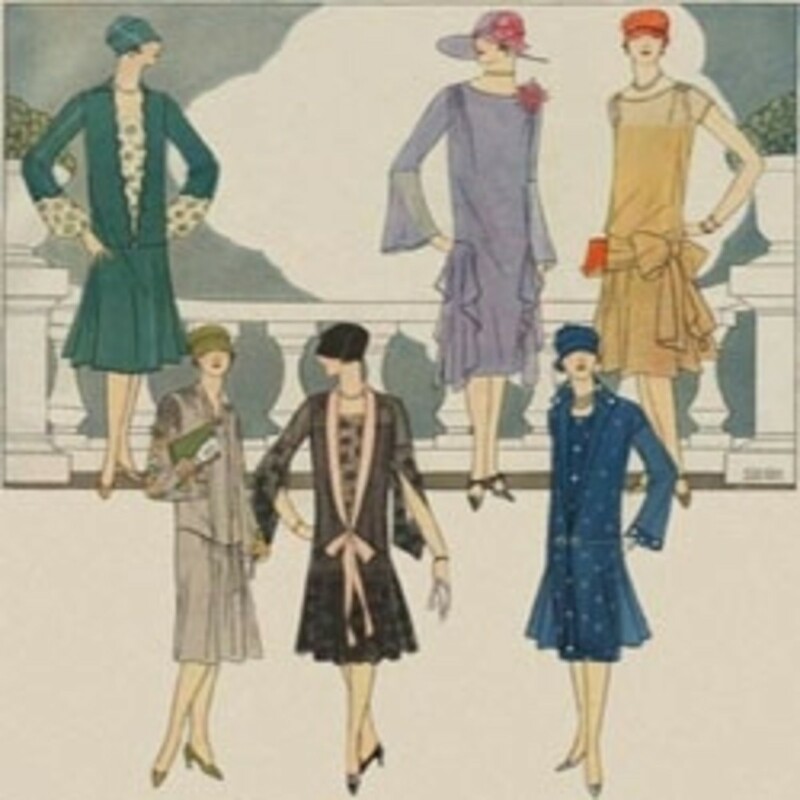 Mix retro or vintage with modern -- it looks great. Try mixing cottage and country or contemporary and coastal -- there is now limit and no rule stating you have to stay within one design style. Eclectic decorating is much more fun! 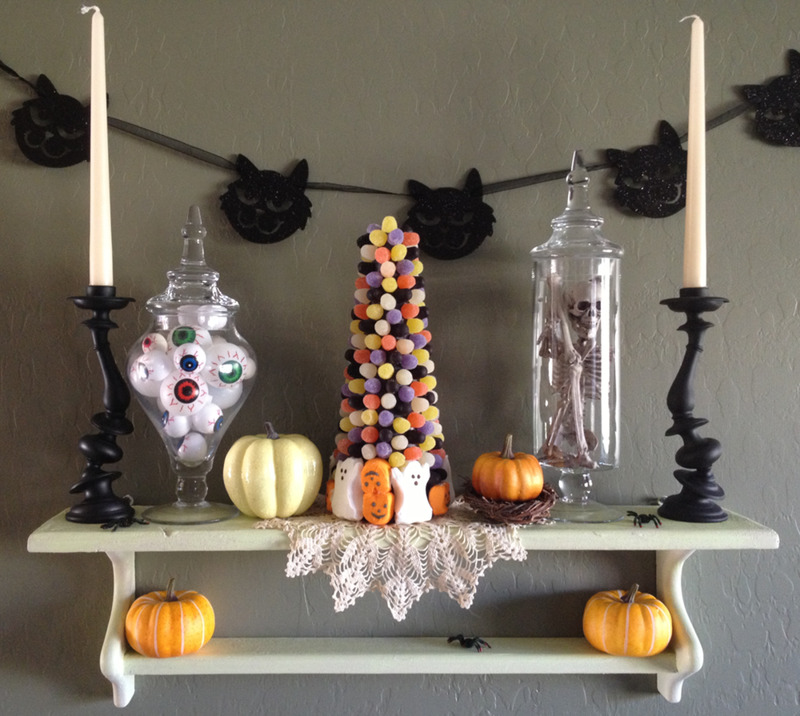 I have always loved decorating -- anything. I have forever described my style as eclectic decorating but what is eclectic style? 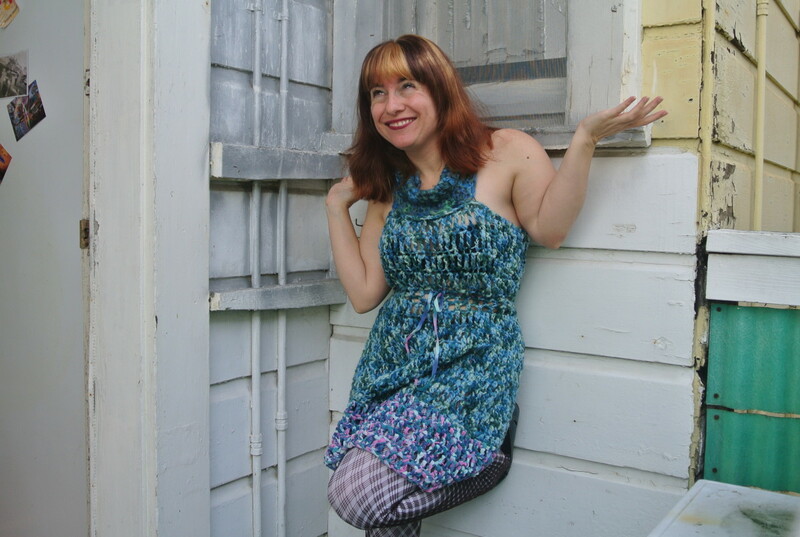 Do you have eclectic style too? 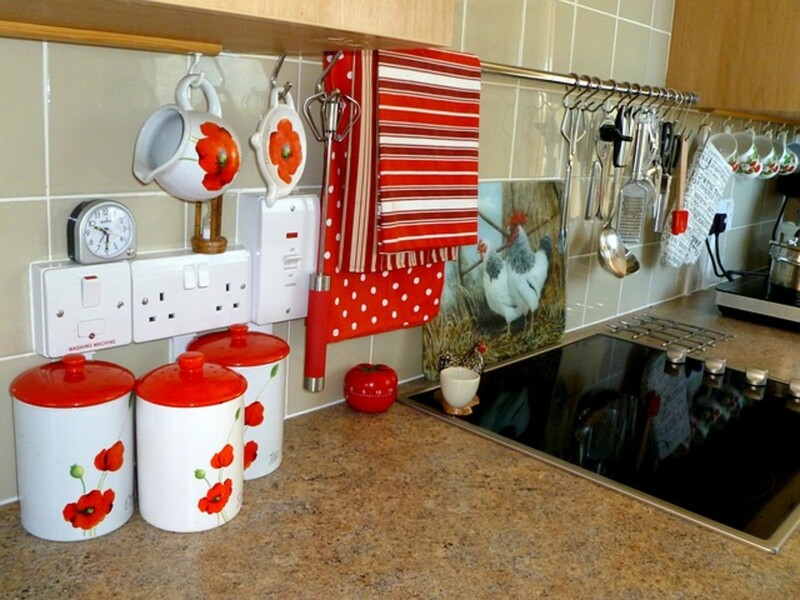 Kitchen Themes - Red Kitchens are Cool! Squidoo is a FREE format that offers you the opportunity to write about your favorite niche topic and make an income or donate to charity at the same time! What could be better? Do you use Retro Decor in your home? 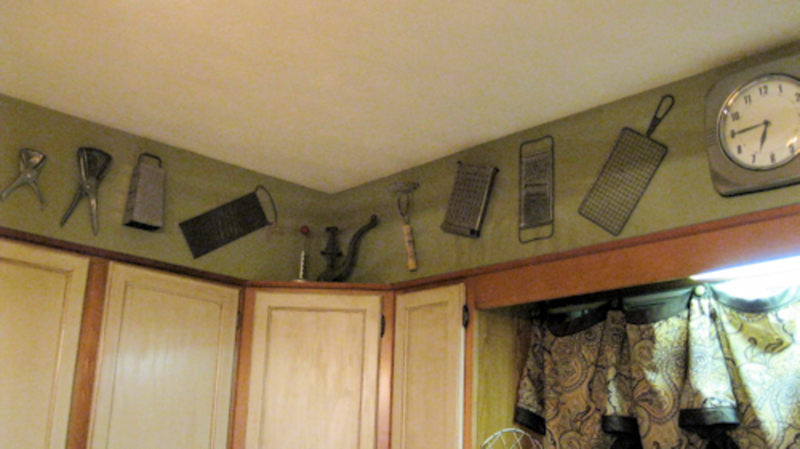 I love the kitchen utensils bordering the top of the wall. I have all of these from my grandmother but actually still use them daily. They must have made them sturdier in those days! 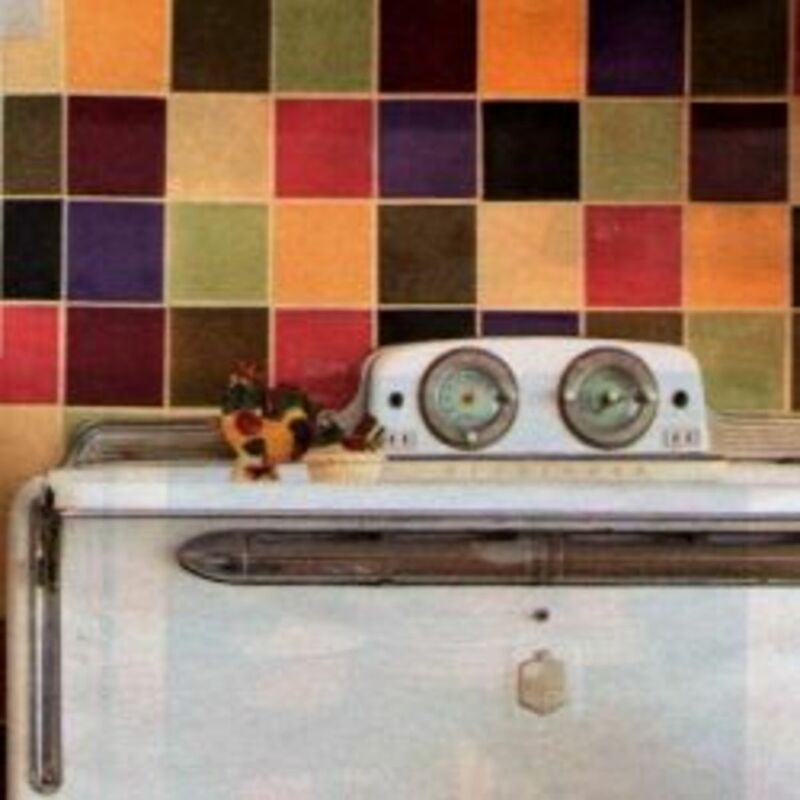 Great tips and photos showing your ideas for retro decorating. 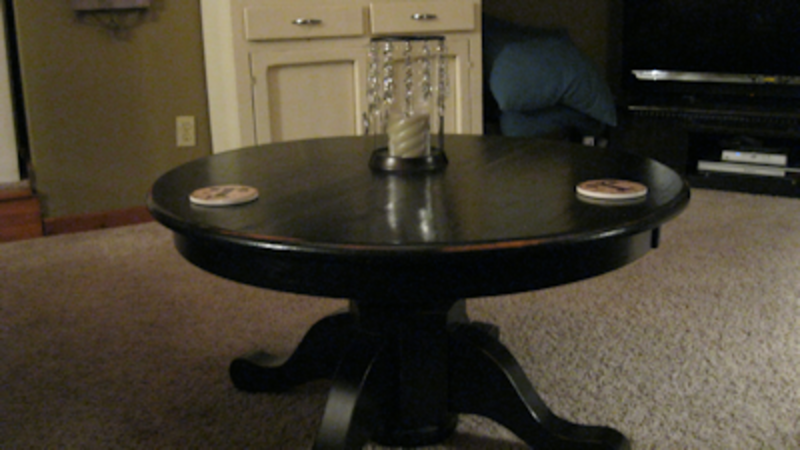 I really enjoy reusing and re-purposing old items, giving them new life and displaying them in new ways. It seems that Retro never goes out of style. Nice lens with lots of good ideas. Oooo, what a charming look! Just love the tips and suggestions you make here. Can't to try this out in my own kitchen - it needs a little retro flair! Love the old look and feel, excellent lens.